We’d love your help. 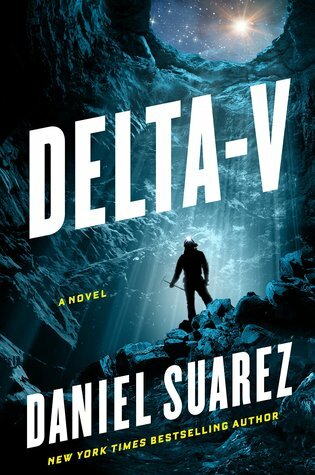 Let us know what’s wrong with this preview of Delta-v by Daniel Suarez. When itinerant cave diver James Tighe receives an invitation to billionaire Nathan Joyce's private island, he thinks it must be a mistake. But Tighe's unique skill set makes him a prime candidate for Joyce's high-risk venture to mine a near-earth asteroid--with the goal of kick-starting an entire off-world economy. The potential rewards and personal risks are staggering, b When itinerant cave diver James Tighe receives an invitation to billionaire Nathan Joyce's private island, he thinks it must be a mistake. But Tighe's unique skill set makes him a prime candidate for Joyce's high-risk venture to mine a near-earth asteroid--with the goal of kick-starting an entire off-world economy. The potential rewards and personal risks are staggering, but the competition is fierce and the stakes couldn't be higher. To ask other readers questions about Delta-v, please sign up. In 2032, various billionaires are competing with each other to monetize space exploration. One of the billionaires, Nathan Joyce, has started an asteroid mining company and wants to find a crew for the first manned expedition. A collection of 440 candidates is assembled. They have varying skills, but they are linked by their daredevil natures. Their number is to be winnowed down to 8 after rigorous training exercises and psychological evaluation. Those selected will go on a 4 year mission to min In 2032, various billionaires are competing with each other to monetize space exploration. One of the billionaires, Nathan Joyce, has started an asteroid mining company and wants to find a crew for the first manned expedition. A collection of 440 candidates is assembled. They have varying skills, but they are linked by their daredevil natures. Their number is to be winnowed down to 8 after rigorous training exercises and psychological evaluation. Those selected will go on a 4 year mission to mine an asteroid. Joyce shares the daredevil qualities of his candidates and, assisted by Lukas Rochat, a young lawyer specializing in space law, he bulldozes over all laws and restrictions that might slow down his project. This book had an interesting premise and parts of it were very exciting. I especially liked the bootcamp-like training. Once on the asteroid, there was a fair amount of technobabble that I generally ignored, but I was fascinated by the concept of using the resources of the asteroid to create not only everything needed to sustain the lives of the crew but also to create the materials needed for the mining venture itself. Most of the focus of the book was on the crew, which was a good thing, because the parts that focused on Joyce were very sketchy. It felt like parts were left out. Joyce and/or Rochat would appear sporadically, but their story line always felt like it needed further explanation. There was also a chapter involving some of Joyce’s creditors. Their motives and actions made no sense and they were like cartoon characters. However, the crew was likable, the science was intriguing and the book was entertaining. There is room at the end for a sequel and I would read it. 5 'Far Stars' for the Konstantin! I should have been sleeping when I read this book but it was so good I had to stay up until the very end. I love reading anything about space, whether it's hard science or science fiction, a fun space opera or a serious article, it doesn't matter as long as it takes me to that otherworldly place in the sky that most of us can only dream about visiting. And this book did just that. From the beginning of the crew's training, through the laughter and tears, and ever 5 'Far Stars' for the Konstantin! I should have been sleeping when I read this book but it was so good I had to stay up until the very end. I love reading anything about space, whether it's hard science or science fiction, a fun space opera or a serious article, it doesn't matter as long as it takes me to that otherworldly place in the sky that most of us can only dream about visiting. And this book did just that. From the beginning of the crew's training, through the laughter and tears, and every new 'first' on their four-year journey, all the way to that final edge of your seat, re-entry, I felt like I was right there with them the entire time. I worked as a NASA contractor for quite a few years and live just a few minutes from Marshall Space Flight Center so my passion for space exploration and all things space related runs quite deep so I love when authors take the time to write about space. Books like these not only allow me to live vicariously through the characters but more importantly, they get kids as well as adults, excited and interested in space science and exploration and the endless possibilities that our future holds. So if you enjoy reading about space flight, space mining, astronaut training, cislunar orbit and/or deep space, give this book a try. Yes, other authors have written about space flight but each story is unique, including this one, 'especially' this one. And if you like space flight stories like I do, you can read about, as many space missions that you can get your hands on. Lastly, I noticed that there were several threads left open for potential follow-up later which gives me great hope that this is the beginning of a series and not a standalone novel. At least, I got a pretty clear impression that the author has further plans for his characters, now whether the publishers are on board, I'm not sure. I really hope they are though because I'm as down for a cislunar and deep space rendezvous, as much as Tighe and Chindarkar are! Jerry Are there any sort of sci-fi twists in this (like Daemon), or is it a fairly straight-forward near-future space story? It felt very tired and the plot overdone. Characters were also very predictable and two dimensional. Initially the book seemed pretty futuristic with all of the space shenanigans going on, but when I heard about the actual touchdown on very same Ryugu asteroid by the Hayabusa2 spacecraft that happened whilst I was reading this book, it made me think that maybe it's not as far fetched as I was originally thinking. (See https://www.sciencealert.com/hayabusa...). There is a ton of research and activity going on with many companies spending millions on space research - so who knows how long we have to wait until travel to Mars and asteroid mining is possible. At times the description does get a bit technical which makes it slightly harder to imagine what is going on, but it is well worth persevering for the rest of the book. The ending is vague enough to leave open the possibility of a sequel which I'm looking forward to. Boring. The plot is tired and the characters aren't great. I wanted to like this book, but I just couldn't. Quite an interesting novel, with parts that definitely made me want to keep reading in spite of my better judgment (read: “maybe it’s time to sleep it’s past midnight and I’m supposed to get up at 5:30 to go to work oh my”). Considering the stakes and the setting, obviously things couldn’t go perfectly, and the characters were bound to run into all sorts of trouble. Although there could have been more trouble than there was, but then, they’d have ended up all dead, because you can’t very well weather ten asteroid showers and the likes without any damage (not a spoiler, I’m just using some generic example here). So all in all, the ratio of suspense vs. things that work vs. things that turn to crap more quickly than you can blink was fairly good. I also really enjoyed the science and the research behind the space technology presented throughout the novel. I wasn’t always on board (see what I did there) with absolutely everything in terms of medical impact on the astronauts’ bodies—but then, considering what our current astronauts already have to go through just after 6 months on the ISS, going for 100% accuracy may just have led, here too, to a bunch of very dead characters, very quickly. I guess we can use some suspension of disbelief on the grounds of “it’s 2030-ish and the consequences are better known, so they’re better prepared, too”. So, in general, I pretty much liked reading the explanations, how the ship was meant to function. The geopolitical side was interesting, too. It is clearly grounded in our present, where corporations invest in space travel and research, and some of the investors/CEOs we meet in the story are definitely parallel descendants of people like Musk and Bezos—although in that regard, Nathan Joyce is probably closer to those, in terms of investing and betting everything on a very daring scheme. The reason I’m not rating “Delta-v” higher is because, like other books of the same type, I found it too ambitious for just one volume. There are two very distinct parts in it: the training and the actual mission, and I kept feeling that each would have warranted a novel of its own. Because of length constraints (I suppose), the author had to go with storytelling shortcuts, which made for a choppy rhythm all along. For instance, one chapter shows what’s happening on the first day of training, and then two chapters later we’re at “a few weeks later”, and so on. My other problem likely resulted from this “shortening an ambitious story into one book”: I found the characters too one-dimensional, and at the end, I didn’t get to know them well enough to really, fully care about them. Tighe is probably the one we know most about, but not so much the others (we get glimpses about Dave, Isabel and Han, but Nicole, Amy and Adisa remained rather a trio of unknowns, apart from a couple of defining feature such as “he’s a genius with computers and hacking” and “she needs to escape Earth because she can hear the movement of tectonics and it drives her bonkers”). And let’s be honest, in a story like this one, we need to care about the characters; we need to be much more invested about them. A new book from Daniel Suarez is always a high-octane treat. His ability to craft mesmerizing tales from his research into new and emerging tech is second to none. In Delta-v, he writes what feels like a future history of space exploration, in the vein of Arthur C. Clarke. Delta-v follows James “JT” Tighe and others on their way to becoming the first commercial space mining mission. Every step along the way, from training & selection, to the climactic return, will up your heart rate and have A new book from Daniel Suarez is always a high-octane treat. His ability to craft mesmerizing tales from his research into new and emerging tech is second to none. 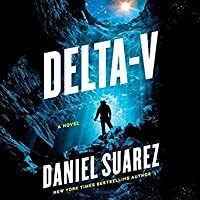 In Delta-v, he writes what feels like a future history of space exploration, in the vein of Arthur C. Clarke. Delta-v follows James “JT” Tighe and others on their way to becoming the first commercial space mining mission. Every step along the way, from training & selection, to the climactic return, will up your heart rate and have you flipping to the next page as quickly as possible. I found myself struggling to pause occasionally to appreciate the world painted before me, rather than rushing through to find out what happens next. The strengths of this book are typical Suarez — impeccable research and uncanny visioning, coupled to an addictive plot and rich detail. The weaknesses are also typical Suarez, in that the human element at times rings false. I found myself occasionally questioning whether the actions of the characters were believable, especially Nathan Joyce, who seemed cartoonish at times. But Daniel Suarez does not write character studies. His books will never enlighten you on the human condition, so if that’s what you’re looking for, there are plenty of other places to find it. You are never in danger of shedding a tear over a Suarez book. However, your eyes will grow wide with wonder and you may find yourself cheering with delight as the worlds he imagines are revealed. You will walk away feeling like you have just glimpsed a possible and plausible future. Thanks to First to Read for the advance reader's copy of this great adventure story! An excellent, well-written, technical and engaging hard sci-fi story, as would be expected from the author. The details are just right and don't obscure the story, and the secondary plot on Earth doesn't detract from the drama in outer space. The personnel are all fairly well-drawn and the main characters are likable to the point of sympathy. The story is well-balanced between pre-launch drama and space action. 5 Thanks to First to Read for the advance reader's copy of this great adventure story! An excellent, well-written, technical and engaging hard sci-fi story, as would be expected from the author. The details are just right and don't obscure the story, and the secondary plot on Earth doesn't detract from the drama in outer space. The personnel are all fairly well-drawn and the main characters are likable to the point of sympathy. The story is well-balanced between pre-launch drama and space action. 5 stars! "Delta-v describes a change in velocity. All celestial objects are in motion-which means you either need to accelerate or decelerate to reach them. The higher the delta-v, the greater the energy-and the greater the expense...delta-v means everything." A space mining expedition set in the near future outlining all aspects - funding, legalities, politics, training, development, etc. Interesting read but very technical at times and I never really felt connected to any of the characters. Thanks to Fi "Delta-v describes a change in velocity. All celestial objects are in motion-which means you either need to accelerate or decelerate to reach them. The higher the delta-v, the greater the energy-and the greater the expense...delta-v means everything." A space mining expedition set in the near future outlining all aspects - funding, legalities, politics, training, development, etc. Interesting read but very technical at times and I never really felt connected to any of the characters. Bought this book from Amazon yesterday and have just finished it. IT WAS EVERYTHING I WANTED. I grew up reading The Rock Rats series by Ben Bova, absolutely loved them because they felt so near-future. This book definitely felt like something we could see happening in the next 10 years. Suarez is my favourite author and has never let me down. You can tell he definitely does his due diligence when it comes to researching, everything felt so plausible. Of you like your scifi hard near term and about to happen this book is for you. Worth the wait. A great thriller about a mission to mine a asteroid in space. This book kept me turning the pages.